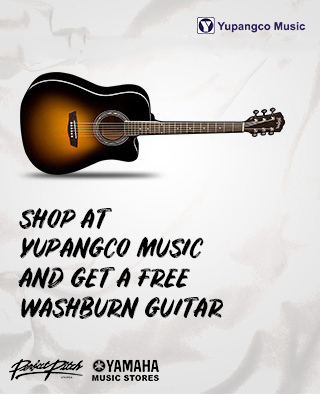 Mabuhay Miles members get a free Washburn WA90CVSB acoustic guitar with a minimum single-receipt purchase of Php 30,000 (Musical Instruments and Accessories) at any Yupangco Music Store. Promotion is open to all Mabuhay Miles Classic, Elite, Premier Elite, and Million Milers. Members must present their Mabuhay Miles membership card (Physical or Digital version) upon purchase to avail of the free item. Offer can be availed from February 1 to April 30, 2019 only. Members may claim the free item from February 1 to June 29, 2019 only. Offer is non-refundable, non-transferable, and non-convertible to cash or gift certificate (GC). G.A. Yupangco & Co., Inc. Terms and Conditions apply. Mabuhay Miles Terms & Conditions apply. Per DTI-FTEB Permit No. 1219, Series of 2019.